This long-lasting natural crème cheek color provides translucent, buildable coverage with a soft, velvety finish. The lush, silky creme to powder, allows ample play time before the product sets, and softly illuminates skin for a healthy complexion. 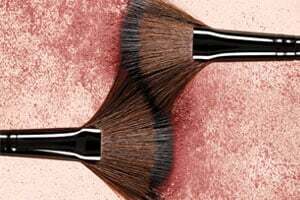 Using Laura's Crème Cheek Colour Brush (sold seperately), apply to the high portions of the face or right in the middle of the cheek – wherever you naturally blush. When using in conjunction with Flawless Face products, always set with Translucent Loose Setting Powder. Praline, Blaze, Canyon,Sunrise: Isocetyl Stearate, Diisopropyl Adipate, Isostearyl Neopentanoate, Polyethylene, Ethylhexyl Isononanoate, Lauryl Methacrylate/Glycol Dimethacrylate Crosspolymer, Copernicia Cerfiera (Carnauba) Wax (Cera Carnauba), Tocopheryl Acetate, Phenoxyethanol, Silica, Retinyl Palmitate, Ascorbyl Palmitate, Isopropyl Myristate, Glycine Soja (Soybean) Oil, Silk Powder (Serica), Anthemis Nobilis Flower Extract, Camellia Sinensis Leaf Extract, Titanium Dioxide (CS 77891), Iron Oxides (CI 77492, CI 77499). May Contain (+/-): Mica (CI 77019), Iron Oxides (CI 77491), Red 6 (CI 15850), Red Lake 7 (CI 15850). Oleander: Isocetyl Stearate, Diisopropyl Adipate, Isostearyl Neopentanoate, Polyethylene, Ethylhexyl Isononanoate, Lauryl Methacrylate/Glycol Dimethacrylate Crosspolymer, Copernicia Cerfiera (Carnauba) Wax (Cera Carnauba), Tocopheryl Acetate, Phenoxyethanol, Silica, Retinyl Palmitate, Ascorbyl Palmitate, Isopropyl Myristate, Glycine Soja (Soybean) Oil, Silk Powder (Serica), Anthemis Nobilis Flower Extract, Camellia Sinensis Leaf Extract, Titanium Dioxide (CS 77891), Iron Oxides (CI 77492, CI 77499). May Contain (+/-): Mica (CI 77019), Iron Oxides (CI 77491), Red 6 (CI 15850), Red Lake 7 (CI 15850). Innocent Peach: Isocetyl Stearate, Diisopropyl Adipate, Isostearyl Neopentanoate, Polyethylene, Ethylhexyl Isononanoate, Lauryl Methacrylate/Glycol Dimethacrylate Crosspolymer, Copernicia Cerifera (Carnauba) Wax (Cera Carnauba), Tocopheryl Acetate, Phenoxyethanol, Silica, Retinyl Palmitate, Ascorbyl Palmitate, Isopropyl Myristate, Glycine Soja (Soybean) Oil, Silk Powder (Serica), Chamomilla Recutita (Matricaria) Flower Extract, Camellia Sinensis Leaf Extract. May Contain (+/-): Ci 77891 (Titanium Dioxide), Ci 77492 (Iron Oxides), Ci 77019 (Mica), Ci 19140 (Yellow 5 Lake), Ci 15850 (Red 7 Lake), Ci 15850 (Red 6). Rosebud: Isocetyl Stearate, Diisopropyl Adipate, Isostearyl Neopentanoate, Polyethylene, Ethylhexyl Isononanoate, Lauryl Methacrylate/Glycol Dimethacrylate Crosspolymer, Mica (Ci 77019), Copernicia Cerifera (Carnauba) Wax, Tocopheryl Acetate, Phenoxyethanol, Silica, Retinyl Palmitate, Ascorbyl Palmitate, Isopropyl Myristate, Glycine Soja (Soybean) Oil, Silk Powder (Serica), Chamomilla Recutita (Matricaria) Flower Extract, Camellia Sinensis Leaf Extract. May Contain (+/-): Ci 77891 (Titanium Dioxide), Ci 19140 (Yellow 5 Lake), Ci 15850 (Red 7 Lake), Ci 77499 (Iron Oxides).